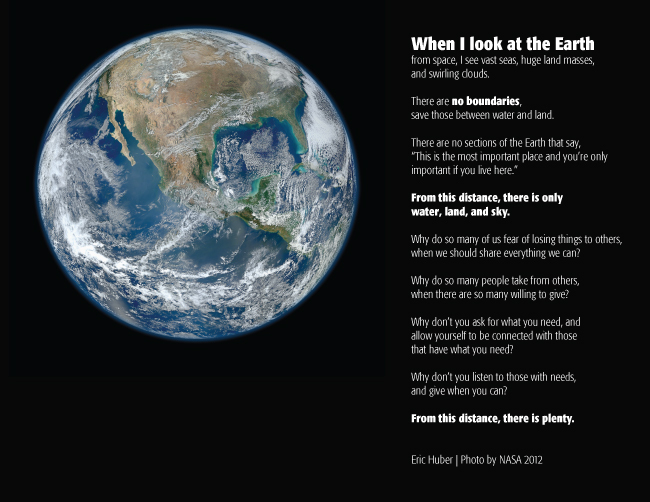 When I look at the Earth from space, I see vast seas, huge land masses, and swirling clouds. There are no boundaries, save those between water and land. From this distance, there is only water, land, and sky. Why do so many of us fear of losing things to others, when we should share everything we can? Why do so many people take from others, when there are so many willing to give? Why don’t you ask for what you need, and allow yourself to be connected with thosethat have what you need? Why don’t you listen to those with needs, and give when you can? From this distance, there is plenty.